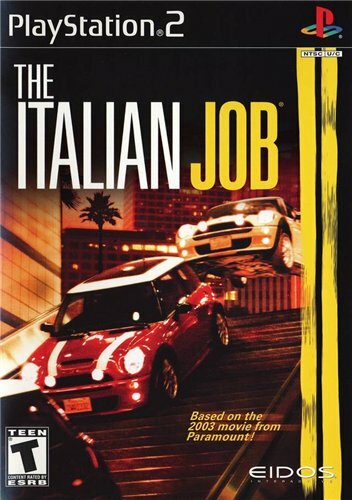 I was one of the thousands of folks who got a car crush on the MINI Cooper back in 2003 after The Italian Job movie came out and blew so many of us away. The car’s popularity was so great at the time that there was a six month wait for delivery if you ordered one new. As I wrote in The MINI Kayaker, I didn’t own a car from 1977 to 2004. I live in downtown Chicago and can walk most places. There is also serviceable public transportation. I could ride my bike sometimes, take cabs or rent a car. One of the reasons I was able to retire at 60 is that I had not spent all that money on cars for so many years. 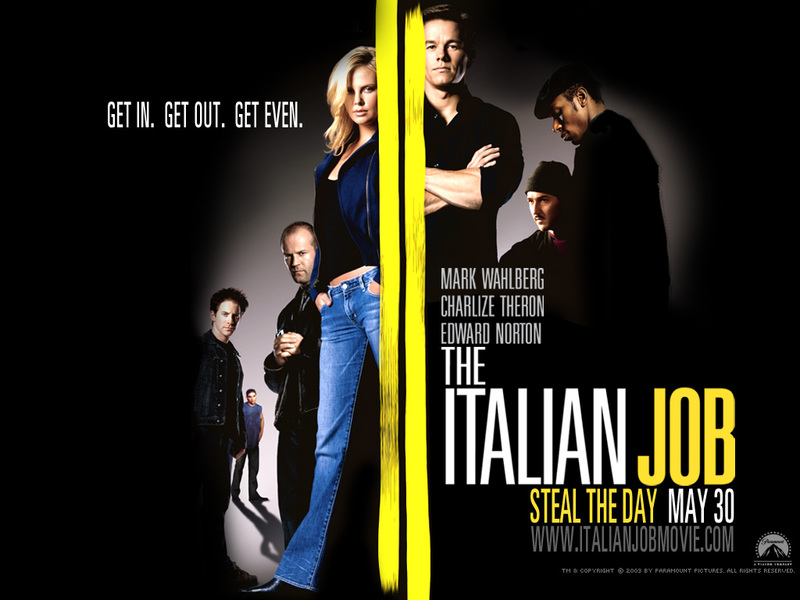 The movie poster was so much fun that PlayStation2 adapted it for their Italian Job game. 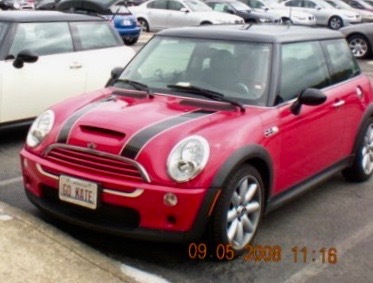 Getting back to my car crush, the first MINI I bought was a used 2003 Cooper. It was dark blue, like one of the Italian Job cars – with racing stripes, natch. Here is the first car I owned in over 20 years. My first MINI. Over the next seven years, I would own one of each, a red and a white also, the other colors in the film. I bought the turbo-charged black MINI Countryman SUV model in 2012. As you can see by the date on the picture, (2008) this was my third MINI. It was a turbo-charged S model. Great fun to drive. I shot this at the dealer in 2012. The car on the left is my new MINI Countryman while the car on the right is the MINI Cooper I traded in. I called the new black Countryman my Badmobile. Sorry for that long lead in, but I have a peculiar history when it comes to cars and I thought that background necessary. Now to my new MINI! It is also pepper white, but this time around I went for black racing stripes on the hood. I thought they looked cool, but also I am the guy who drives at 55 MPH in the right lane who everybody passes. I thought it was funny to have racing stripes on that car chugging along in the right hand lane. My New MINI on the left and the MINI SUV I traded in on the right in the dealer lot. My new MINI is a revelation to me. I love it because it looks and handles like a toy. In the past six years, the company has increased the size of the car so that it is now as big as the six-year-old SUV model that I traded in. The innovations are amazing. I have a built-in Navigation system with a female voice talking to me with a British accent. What could be cooler than that? There are all kinds of neat tweaks like if I hit the turn signal lightly it blinks three times to signal a lane change. It doesn’t keep flashing like through a turn. But the biggest change is that they have downsized the engine. That is, I didn’t get the model with the turbo charger like I had in my last one. The new one has only three cylinders. I got 32 miles to a gallon on my MINI SUV, so far, in two weeks it looks like over I am logging over 40 mpg. I will know with more accuracy as I add miles. I still need to burn high-test gas, though. Last but not least is the joy of driving a MINI. It is famed for its bulldog grip on the road. I love the fact that I can accelerate through turns while other drivers are hitting their brakes. The lack of a turbo charger means a less powerful engine. For a guy like me who drives stick shift that means a lot more fun driving as there is a real reason to change gears. With the more powerful engine, it covered a multitude of sins so I could change gears pretty much any time I felt like it. Not so with this one. I need to change gears much more carefully. So, I am becoming a more careful gear jockey. I have to include one last picture because, while it is silly and superficial, I find it to be one more exciting and fun aspect of owning this car. Above is a shot of the car in my garage. See the MINI logo on the ground? That is light projected from my door whenever I open it. One the coolest things I have ever seen. A very cute post! We have so much stuff in our lives. Isn’t it great when we find something that really and truly brings us joy? I am working to be more selective. Spend my time and money only on what really fits my needs, and hopefully brings me joy 🙂 (get rid of all the other stuff ) I hope you continue to enjoy your new car… and be safe! Thanks for your kind words, Lisa. Much appreciated. I feel like a little kid with this car. Keep finding excuses to take it out. That is ridiculous for a guy who just traded in a car he owned six years and put only 25,000 miles on. I know people who do that in a year. Cool car, Tony. I’m glad you like it. Cars are super cute , so as the post. Having a joyride is one thing but having in your favorite one is a truly bliss.. Thanks for your comment, Perky. You definitely get it.